In lapping, two surfaces are rubbed together with a lapping medium (lapping fluid and lapping grit) trapped between them. Material is removed by the countless loose particles between the carrier surface (lapping plate) and the workpiece pressed against it. The particles are rolled to a greater or lesser extent according to the hardness and porosity of the carrier surfaces, thus performing a kind of kneading, material-removing action on the workpiece surface. If the grit is kept from rolling, either by corresponding selection of the carrier plate, pressure or the fluid, this will cause the particles to become stuck and will lead to an extended material deformation process in a similar manner to grinding or honing. This will therefore tend to push up the material at the front or sides. For a long time it was supposed that in all cases the loose grit cut the surface. 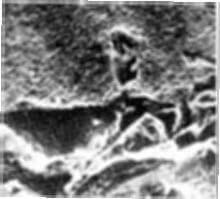 The rolling effect with its kneading action was only discovered by means of research with the electron microscope (Prof. Dipl. Ing. K. Martin). 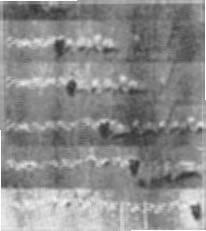 The process with bound grit particles is described in this article (also see Page 22). A simple way to observe the action of particles as illustrated above is to strew coarse lapping powder (about 150 my) on a finely lapped aluminium plate, and to cover with a scratch-free plate of perspex, which is then slid sideways slightly under a light pressure. 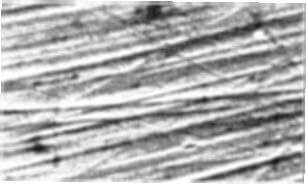 Figure 3 shows, at high magnification, traces left by the rolling lapping particles on the fine surface. 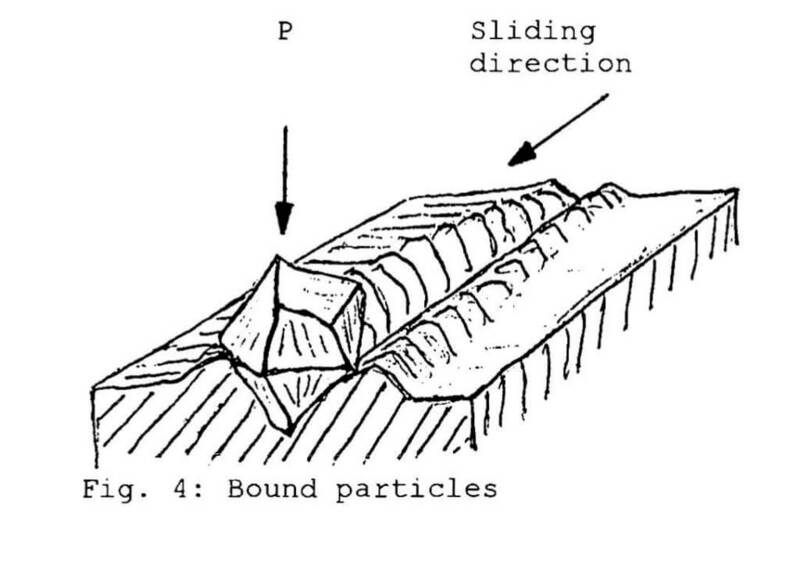 With the continuous lapping process, the continuous kneading effect causes material to break out of the machined surface, as shown in Figures 6 and 7. Figure 8 shows the result after an extended lapping time of 2 seconds with x grit particles. Fig. 6: Rolling process in several phases. Observe the traces (clouds) in the perspex plate. Fig. 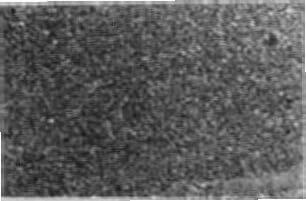 7: A workpiece surface covered with lapping traces (12x mag.) Initial surface finely lapped, material AlMgSi, SiC lapping powder, partoce size 150 microns, lapping time 0.1s. If the hardness and micro-structure of the carriers or lapping plate (or carrier) are such that rolling cannot occur because the particles become stuck, as already mentioned, the result is a cutting or sliding action. 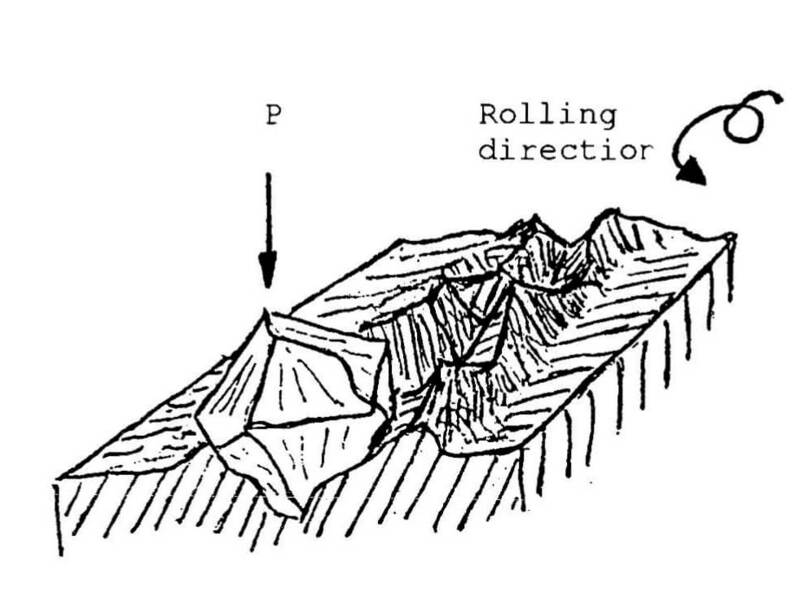 Surfaces lapped by rolling appear matte (Figure 8), while pushed, cutting grit produces bright and even shiny surfaces (Figure 5). 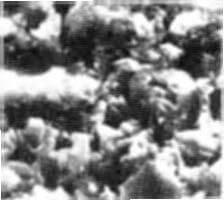 High magnifications of matte lapped surfaces show roughened material particles (Figure 9) that can, if necessary, be polished with extremely fine abrasive paper or with a polishing machine. considerably widened. 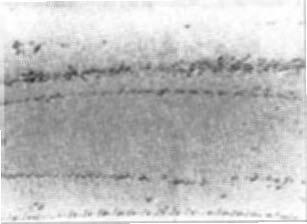 The development of new carrier plates and their surface design, e.g. special grooves etc., as well as special fluids as a grit medium have resulted in further significant production increases during the last decade. The micro-particle diamond powder is continuing its success in grinding technology and in lapping and polishing technology. 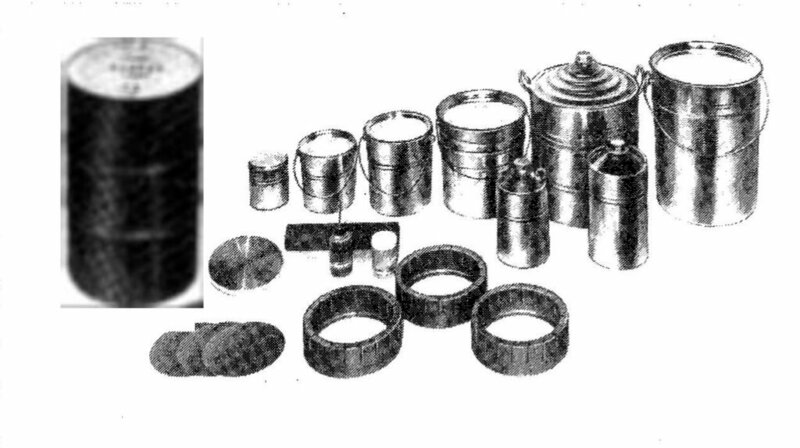 tin, aluminium alloy, copper etc. sintered metal powder (see also Figure 34). A working plate hardness value between 140 and 220 HB has been found to give optimum results. Plates with these hardness values can be continually corrected by means of conditioning rings in single-plate lapping machines, allowing high precision of the dimensional, flatness, parallelism and surface finish criteria required. Lapping always requires a medium, which is manufactured with additives. Oil-based media are generally referred to as lapping oils or oil-soluble lapping fluids. Carriers based on water or a similar fluid are called water-based lapping fluids. The term “lapping agent” generally refers to a ready-to-use agent (product), i.e. fluid and grit.